Looks fancy, tastes absolutely delicious, and is incredibly easy to make. 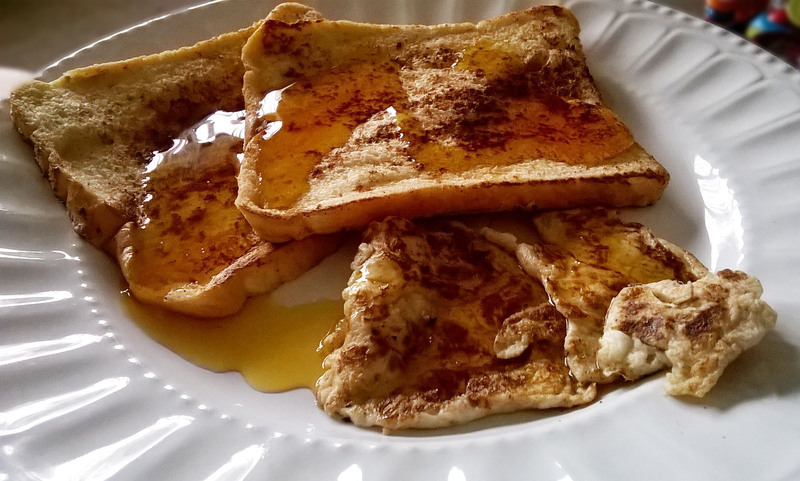 French toast is one of those “posh” breakfast items that you think will take too long to make, but really – I just made 8 rounds in 5 minutes (minus the clean up – which I’m going to do after I’ve finished this post). I first had French toast when I went to stay with my fathers’ friends, in Wisconsin, USA, and it was sublime! However, when I got home, I couldn’t remember exactly how my host made it, so I winged it… It worked out well, because now it’s a family favourite – even Donut (aged 2) has just wolfed down two slices! Mix the eggs, milk, and a good shaking of the mixed spice in a bowl – ensure the bowl is big enough to fit a slice of bread, without bending it. Heat the coconut oil over a medium to high heat, in a frying pan. Place a single slice of bread in the egg mixture, and turn it over – make sure the round of bread is fully covered. Add the egg-mix covered bread to the frying pan, and give an extra little shake of the mixed spice. Leave for 30 seconds or so, then turn it over – repeat the process by adding another little shaking of the mixed spice. After another 30 seconds, turn the bread over for one final couple of seconds – just to allow the second shaking of mixed spice “cook” a little. Serve with a helping of syrup or honey, fruit, such as raspberries, blackberries, strawberries, or icing / powdered sugar. Best enjoyed hot / warm, although, rather lush cold too, ha ha. The French toast shown above is an image found on Google… My French toast was scoffed before I could even think of getting my camera! As Donut was kind enough to wait until 7am to wake up (very proud), I gave him his bottle, and I wondered what I should make for breakfast this morning. I have a tendency to buy eggs, pop them in the fridge (although, technically, you shouldn’t store eggs in the fridge – they should be kept at room temperature – it’s just that my kitchen is SO hot!) and then forget all about them. What usually happens next is that I fancy a fried or scrambled egg, so I go to the fridge, and then cringe as I look at the “use by” date. Today was no exception… I opened the fridge, and I starred at the five eggs that were sitting in the fridge. They were still in date, as I had only purchased them on Thursday evening. I realised that I had also only 6 rounds of bread left… Now breakfast is an easy choice when you have these essential ingredients. If you use 2 rounds per person, this breakfast costs approx. 50p per person. In a bowl, whisk together the egg, milk and a good sprinkling of your powdered cinnamon (or sweet mixed spice). Place enough oil in a frying pan, and heat gently. Dip the bread – one round at a time – in to the egg mixture, and place in the frying pan. Sprinkle a little more of the powdered cinnamon (or sweet mixed spice) on to the bread. **Note: Do not “dip” more than one round of bread at a time in to the egg mixture unless you have enough room in your frying pan. Allow to fry for approx. 2 minutes, then turn over. Add a touch more powdered cinnamon (or sweet mixed spice) to the round of bread, then allow to fry for another 2 minutes. Turn over once more to quickly “seal” in the powdered cinnamon (or sweet mixed spice). Place on your plate, and serve either on its’ own, or with a lashing of golden / maple syrup. I ended up with excess egg mixture at the end, so I just put a drop more oil in the pan and poured the egg mix directly in. It was like a sweet omelette. Again, I poured a little of the syrup over the finished dish. After contemplating our finances, and wondering what we can do to keep our outgoings down, I decided that the cheapest way we can all have our cake and eat it too (literally) would be to make our own treats. 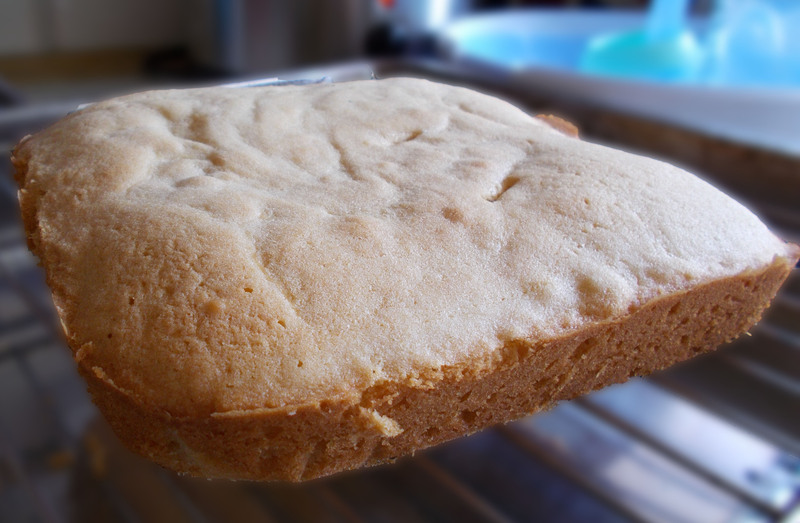 Here’s a gorgeously light and fluffy cake, that takes about 40 minutes from start to finish, and I worked out that it cost about 45p to make. Preheat your oven to 170C (150C for fan assisted). Grease your cake tin and line the bottom with a sheet of baking paper, or line your cupcake tray with paper cases. In a separate bowl, whisk together the eggs, golden syrup and a few drops of vanilla essence, then pour in to the butter-sugar mix. Using a large, metal spoon, fold in the flour, a small amount at a time. To ensure a fluffy cake, sprinkle the flour from a height. Pour the mix in to your cake tin / paper cases. OPTIONAL – Sprinkle a little more soft, brown sugar or coloured sprinkles on the top of the cake(s). Place in the preheated oven for approximately half an hour, or until a skewer (or sharp knife) comes out clean. Allow the cake to cool slightly in the tin (approximately 10 minutes) before turning out on to a cooling rack (don’t forget to remove the baking paper from the base).